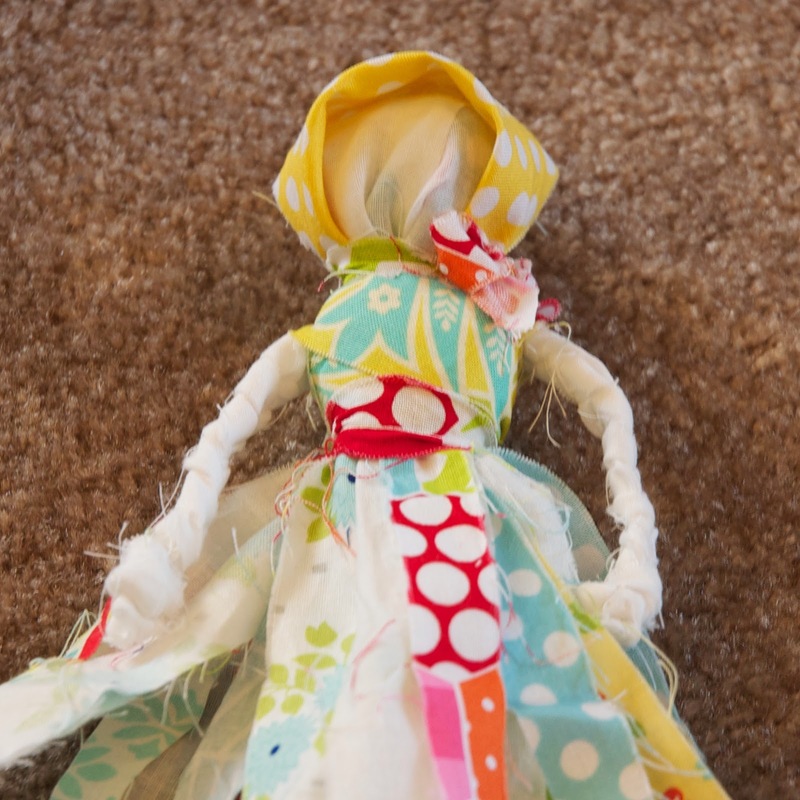 For my daughter's, Little House on the Prairie party, the guests all made rag dolls. 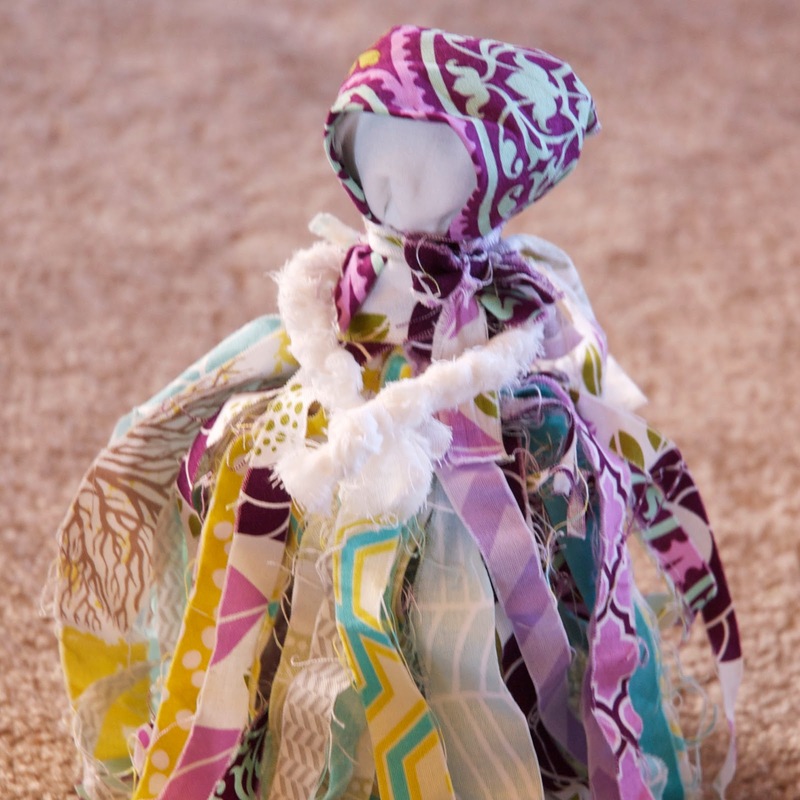 The girls did a great job, and the dolls turned out so adorable! Here are a few pics from the party. 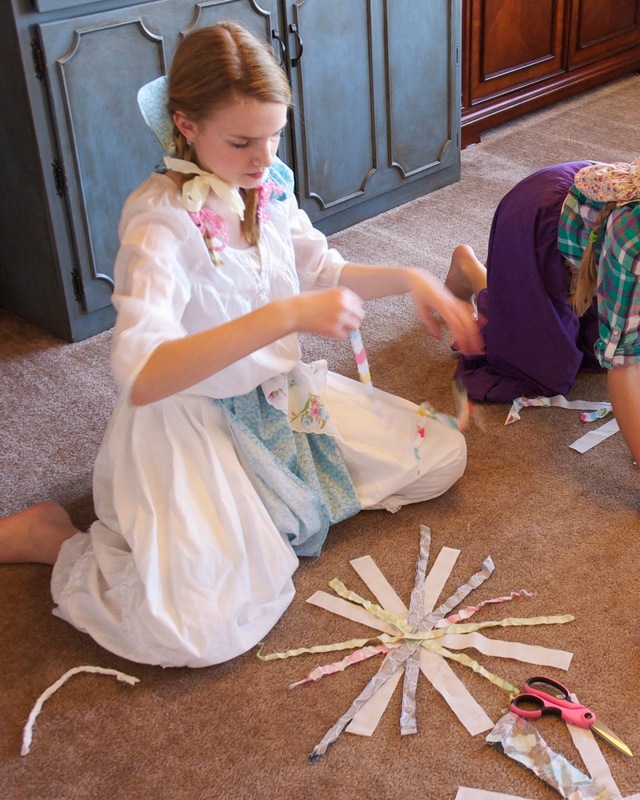 The girls had fun, and were so creative! They are my favorite fabric shop! 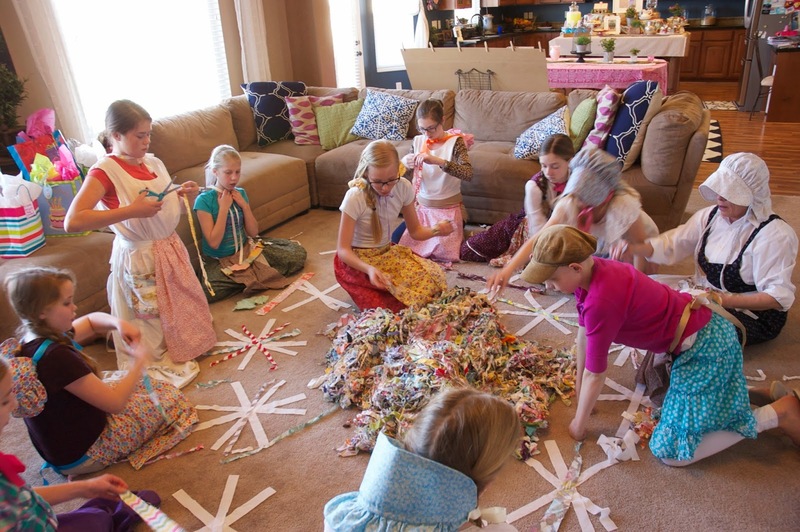 It was super easy for the girls to do, and they caught on right away. They could all do it themselves, which is always a bonus! Doesn't my daughter look lovely in her prairie attire? 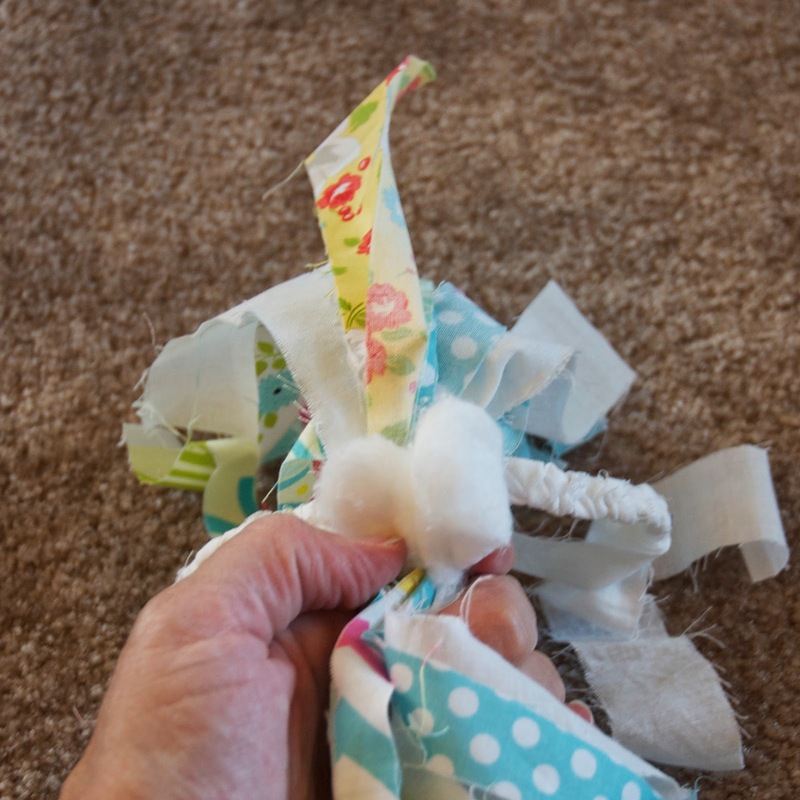 For my fabric, I tore 1" strips of regular 45" fabric in strips, then cut it in half, so each piece of fabric ended up being about 22 1/2" long. Make the arms first. 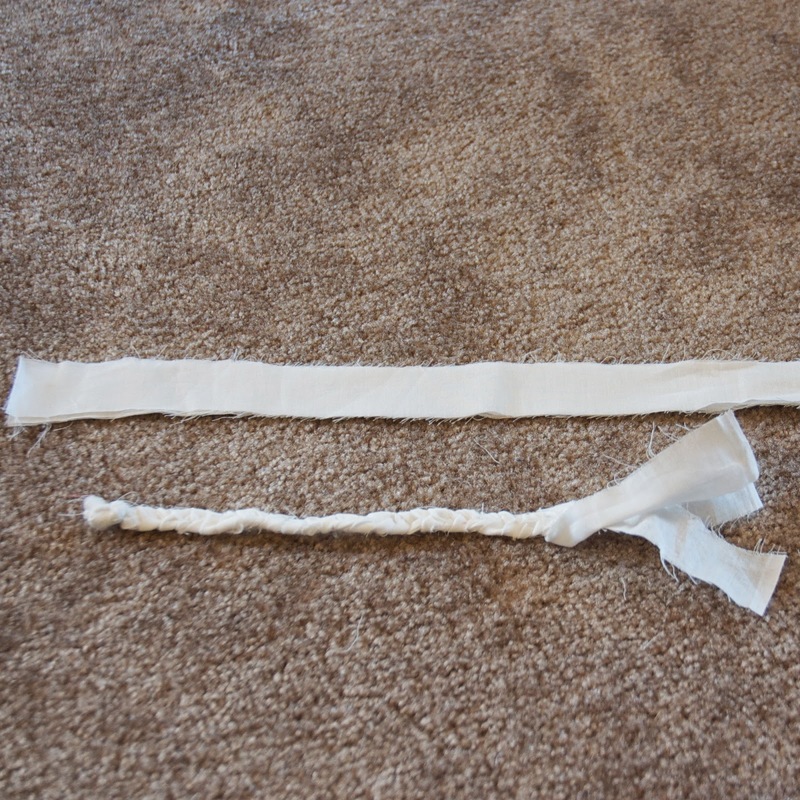 Tie a knot on the end of three of the strips of white strips, and braid about 6ish inches, leaving one side untied. 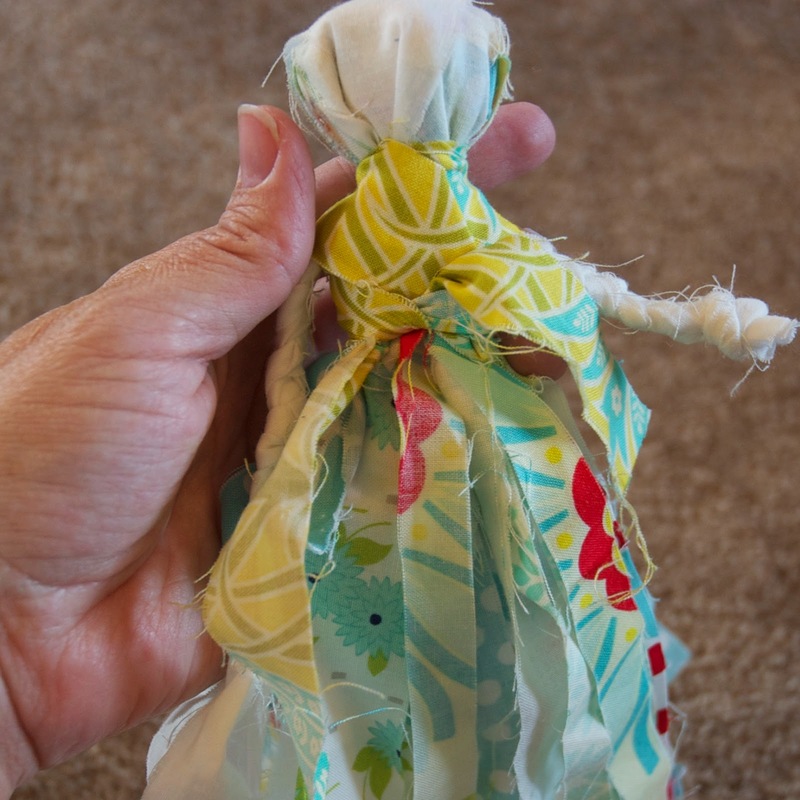 You will tie it after the doll comes together, and you see how long you want the arms to be. Place 3 strips down on the floor first. This will be the head. 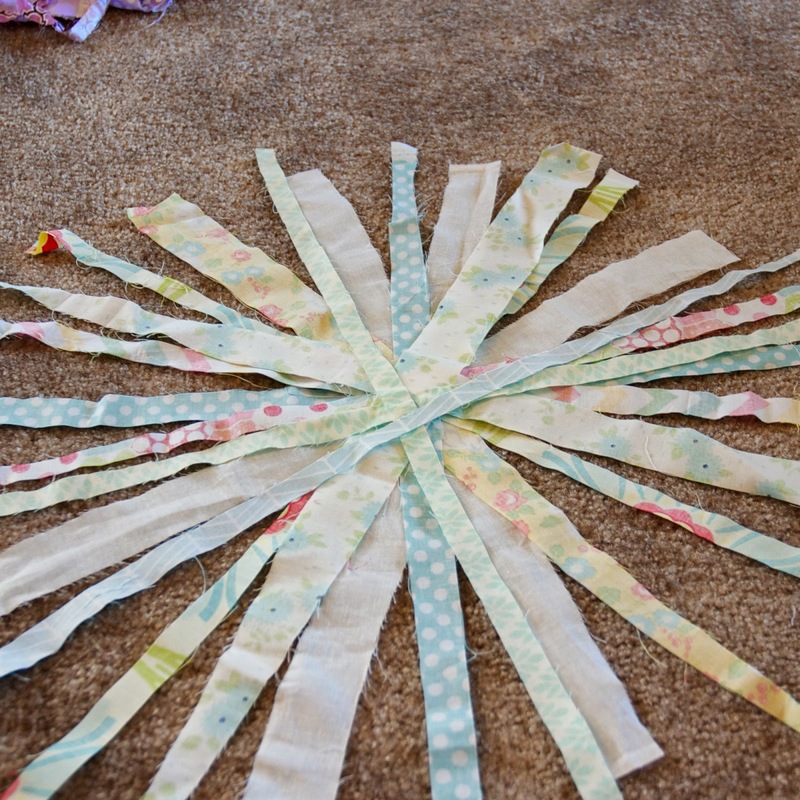 Start layering 12 to 24 of the patterned strips on top of the white, with the printed side down. This will be the top of the dress. Layer more strips if you want it more full, less strips if you want the skirt less full. 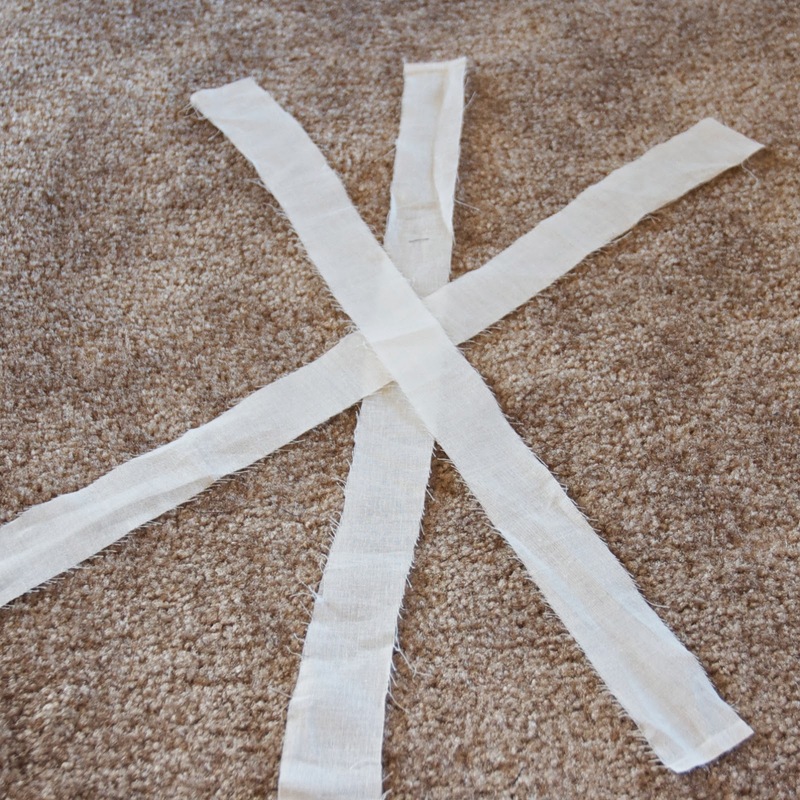 Make sure to leave about 3 strips out of the mix for additional ties you will need to make. 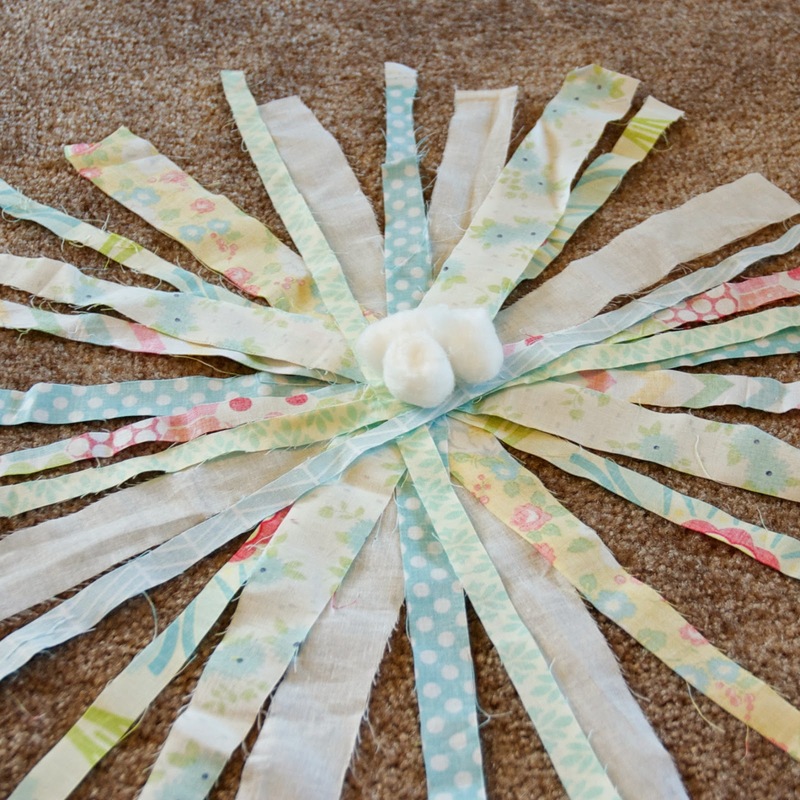 Place 3 cotton balls in the center of the circle. This will be stuffing for the head. Reach your hand under the whole thing and flip it over, holding on to the middle. 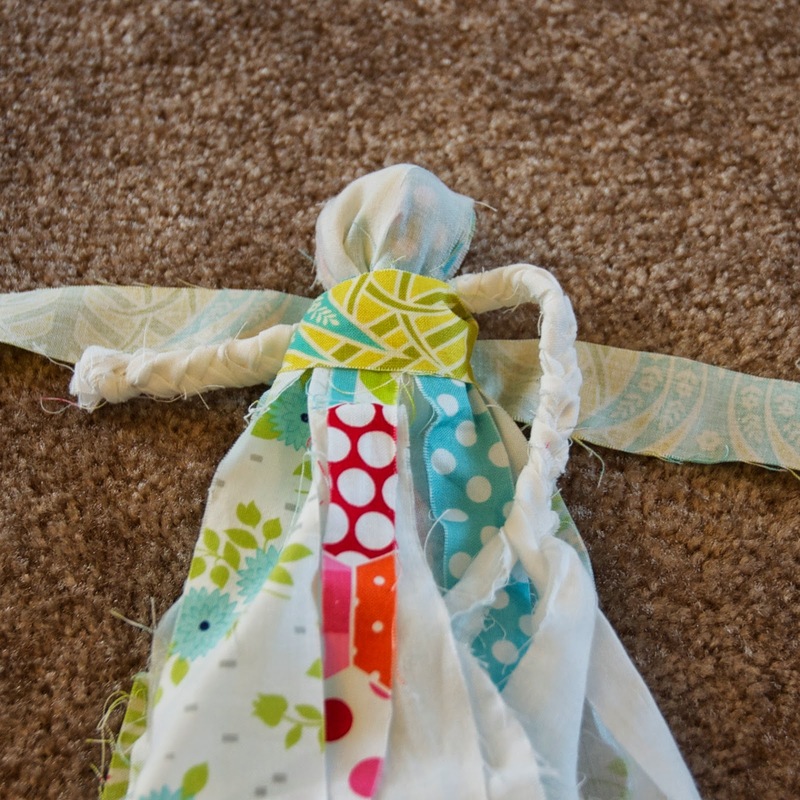 Then, tie a thin fabric strip around the neck, synching it in nicely. Next, decide what part of the white you want to be the face. 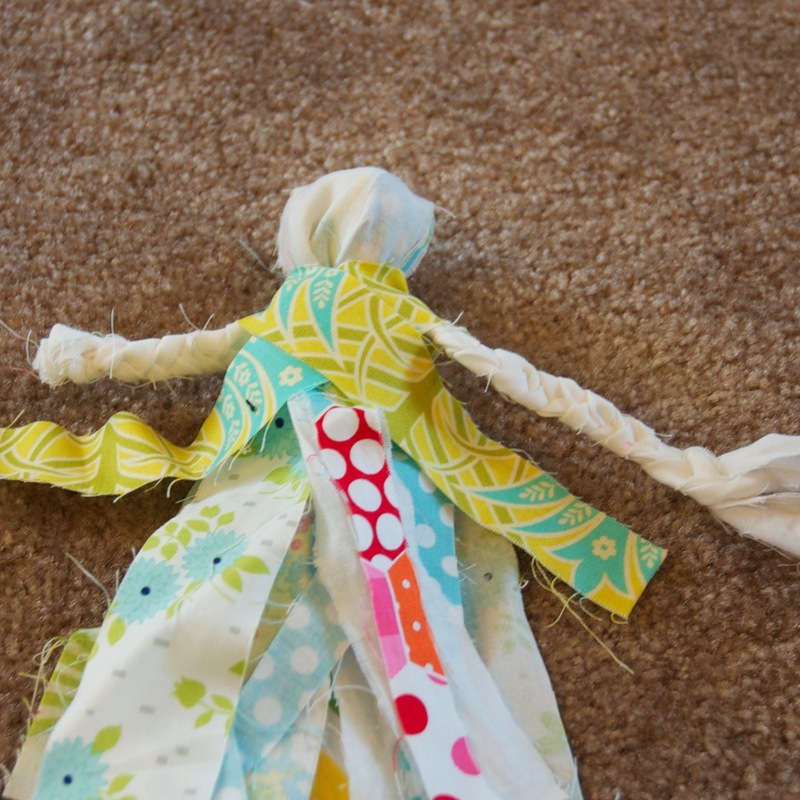 Insert the braided arms in the middle of the fabric. Insert two or three more cotton balls for the chest. 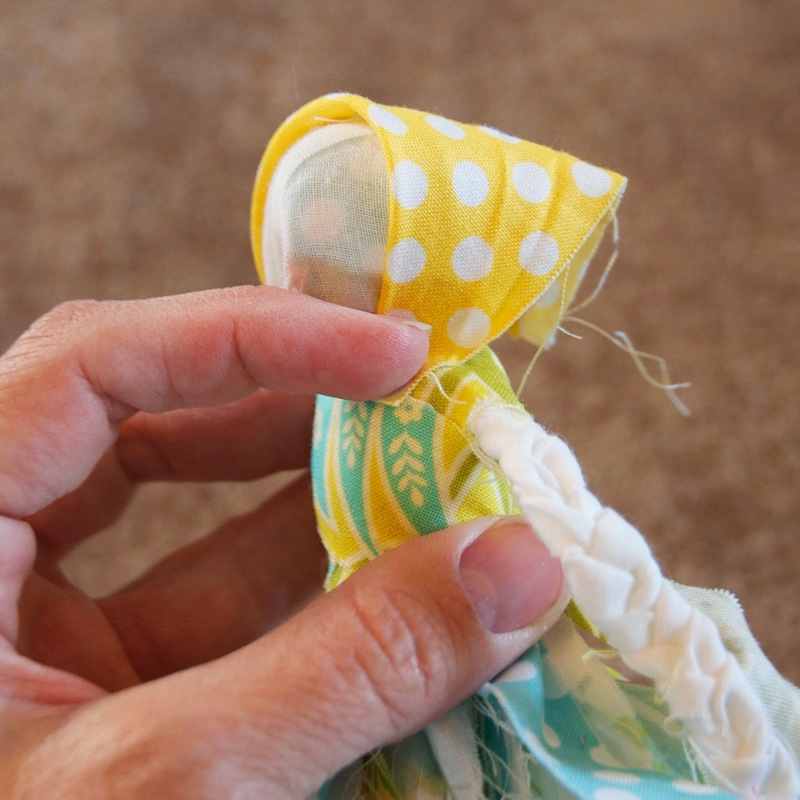 Flip the fabric over, and wrap another strip around as shown in the photos. Time for the bonnet. 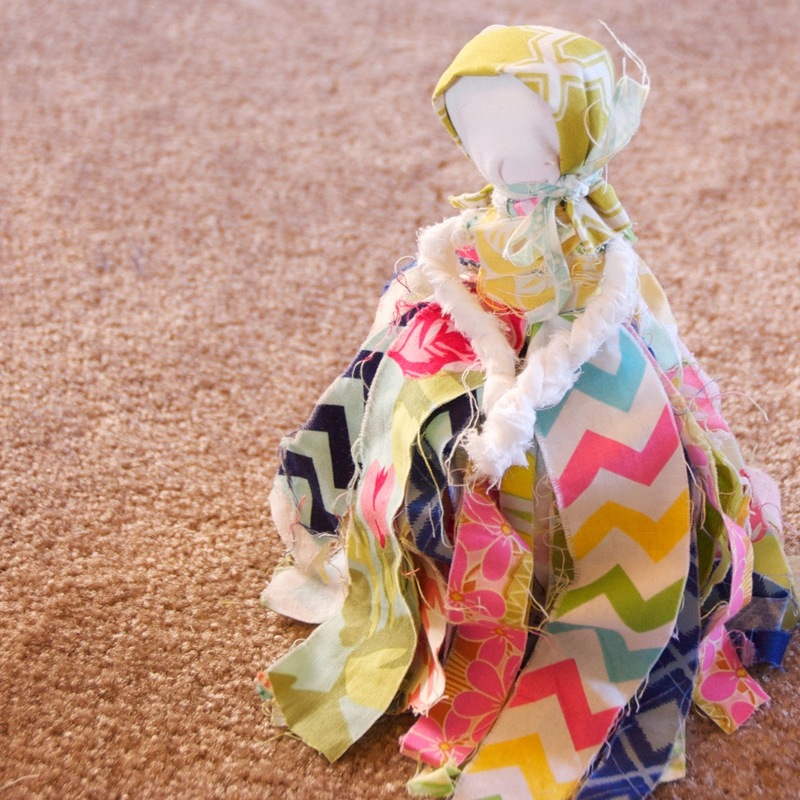 Cut a 3"x3" piece of fabric, and fold in half diagonally. Place over the head as a bonnet. Tie with another thin strip of fabric. 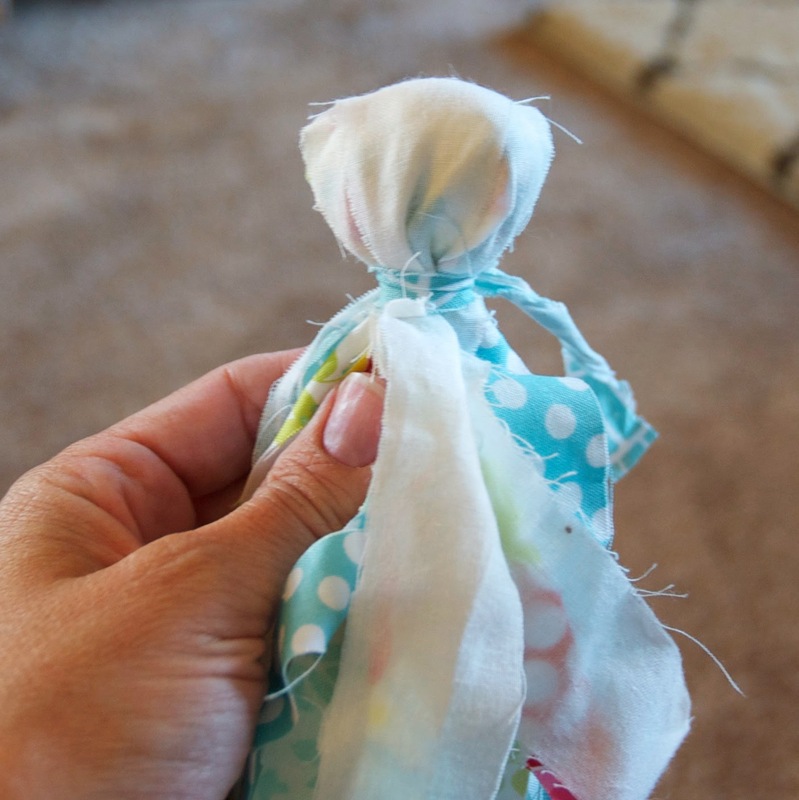 Tie more fabric around the waist if you feel like it. I wanted more red, so I did. This is also a good time to tie the other arm off at the length you wan't, and cut the excess fabric off. I LOVE how she turned out. Wouldn't she be darling on a young girls bed? 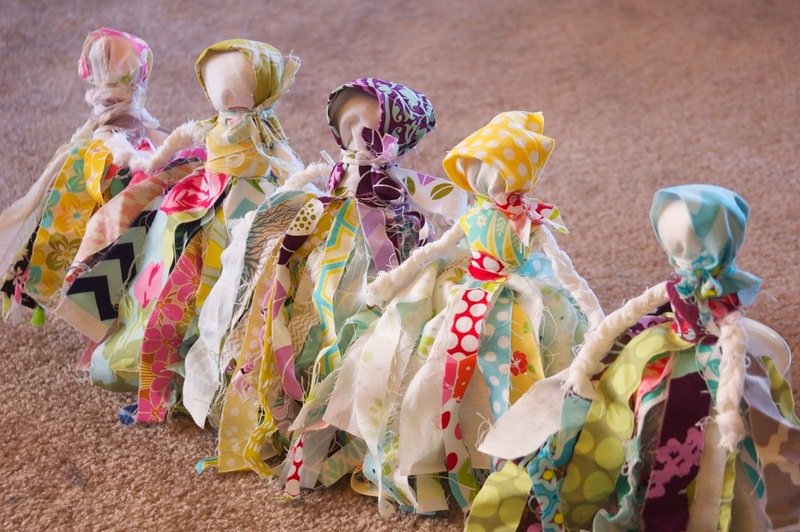 Five little rag dolls all in a row. Here are a few more closeups. They don't stand. I have them all on upside down cups. Thanks for stopping by. 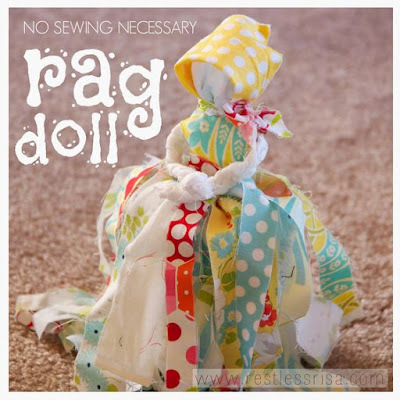 Get out your old fabric scraps, and make a rag doll. They are addictive! Oh for the love ... so darn cute !!! Ahhhh! 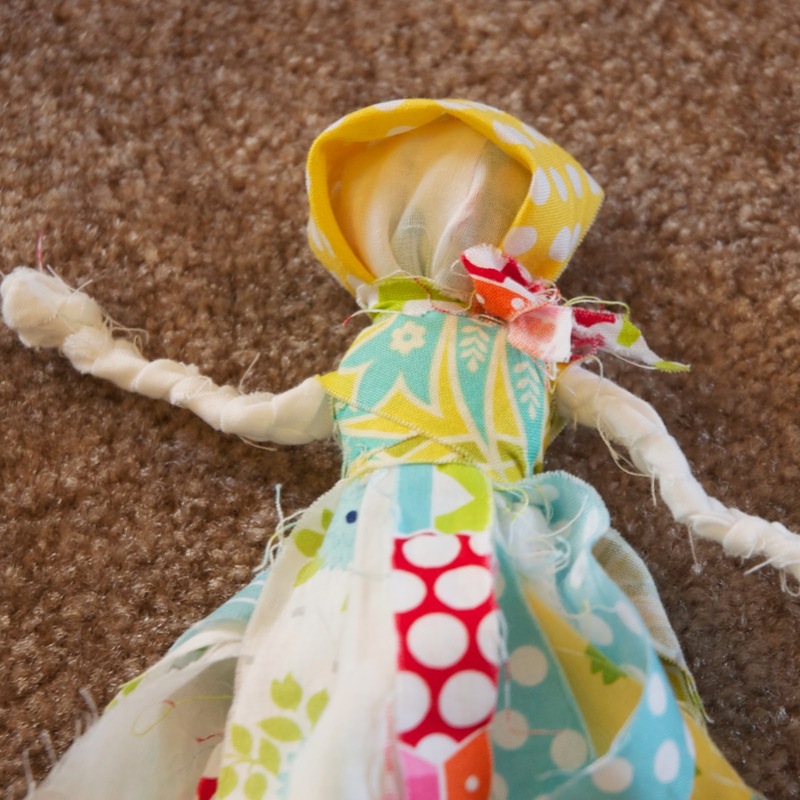 I always love your doll series. The dolls are so cute! How old were the girls who made them? Do you think 2nd and 3rd graders could handle it? How long did they take to make? 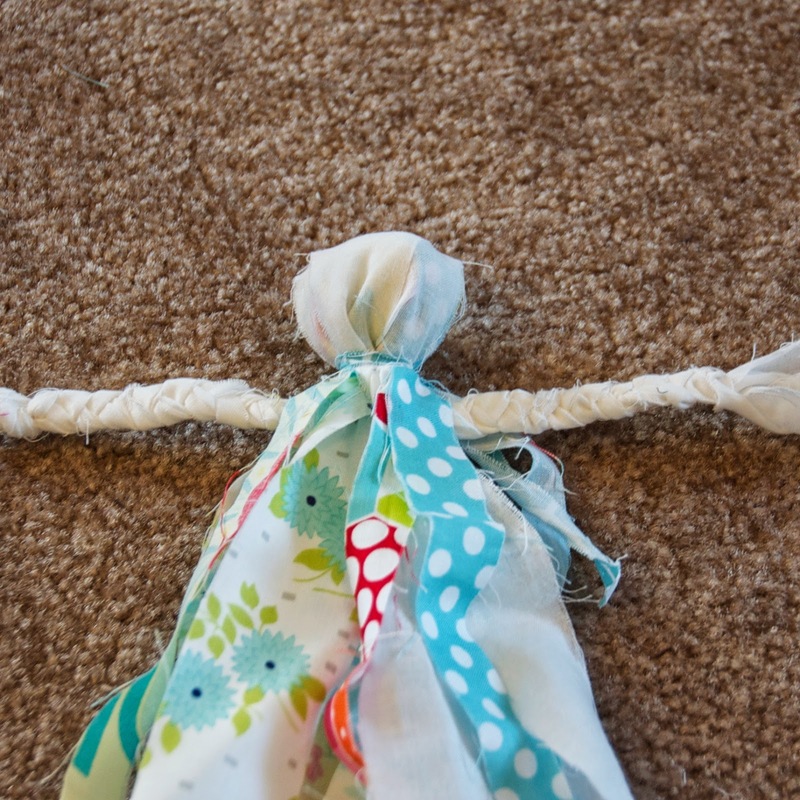 I'm thinking about doing this as one of the crafts for an upcoming Brownie Camporee. Thanks for visiting - Good luck! Thank you! This is EXACTLY what we needed to finish my daughter's 5th grade project that is of course due tomorrow! :) Thank you SO much!! Thanks so much for this tutorial! 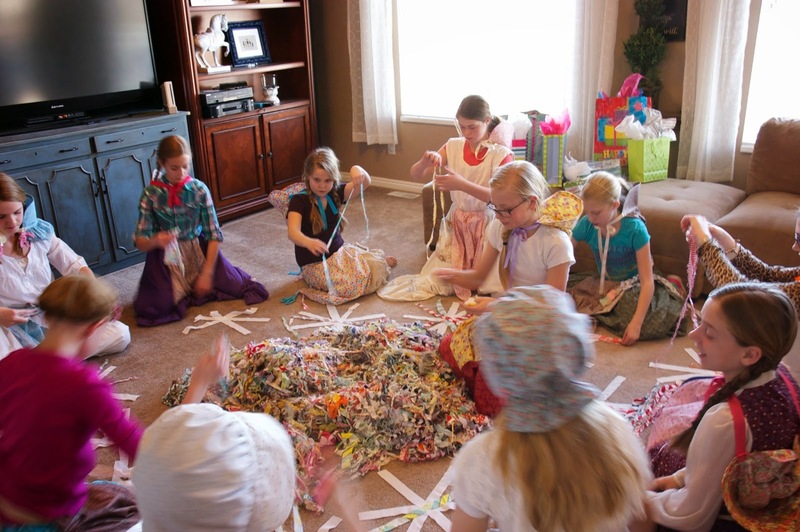 I am looking forward to doing this for my daughters party this weekend. 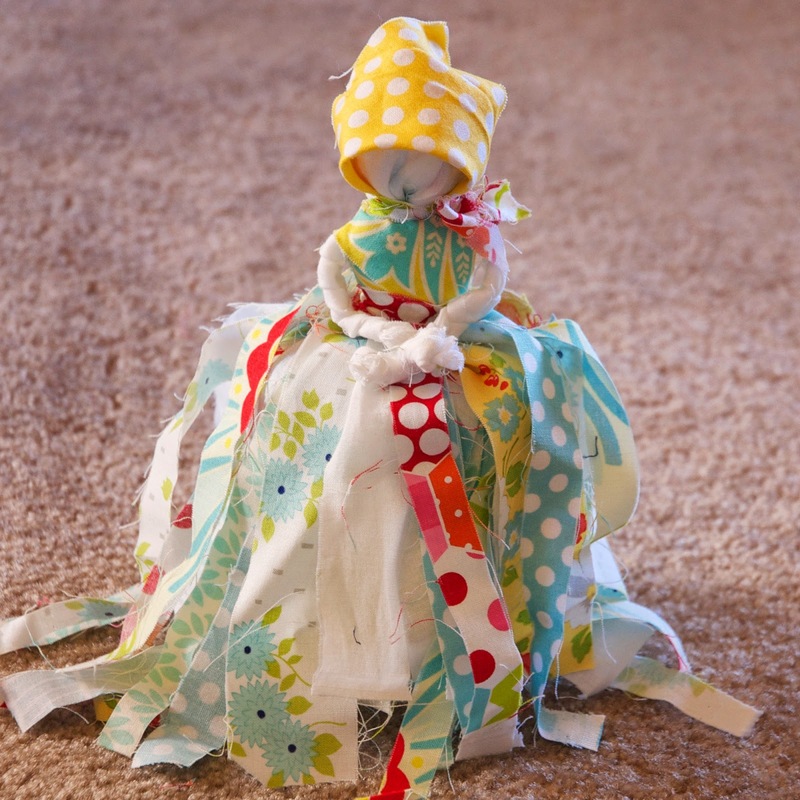 This is such a cute,simple, doable craft! 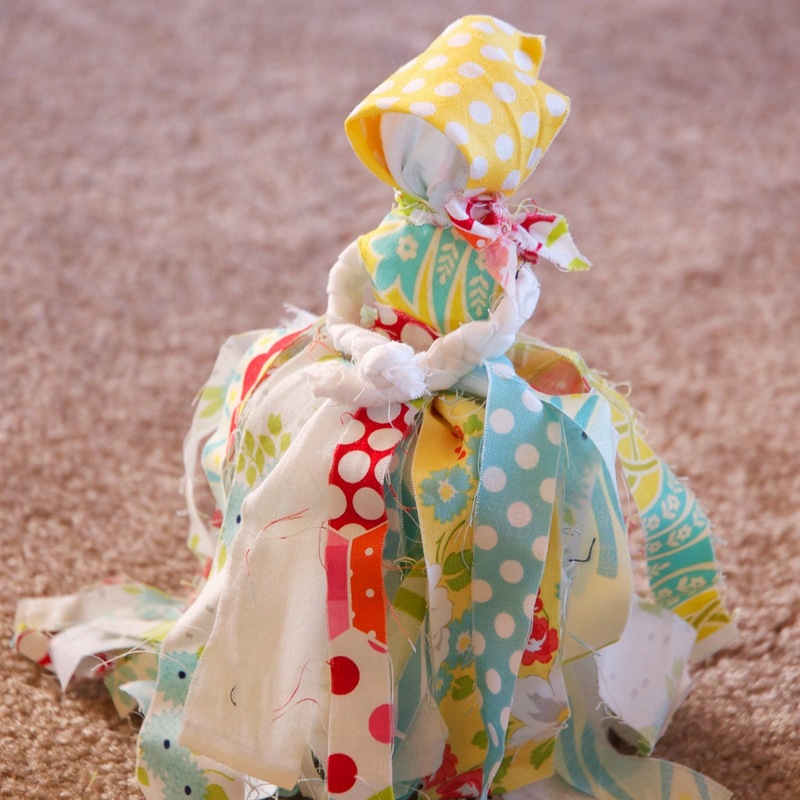 We are making these for Activity Days this week! I am so glad I found this on Pinterest. 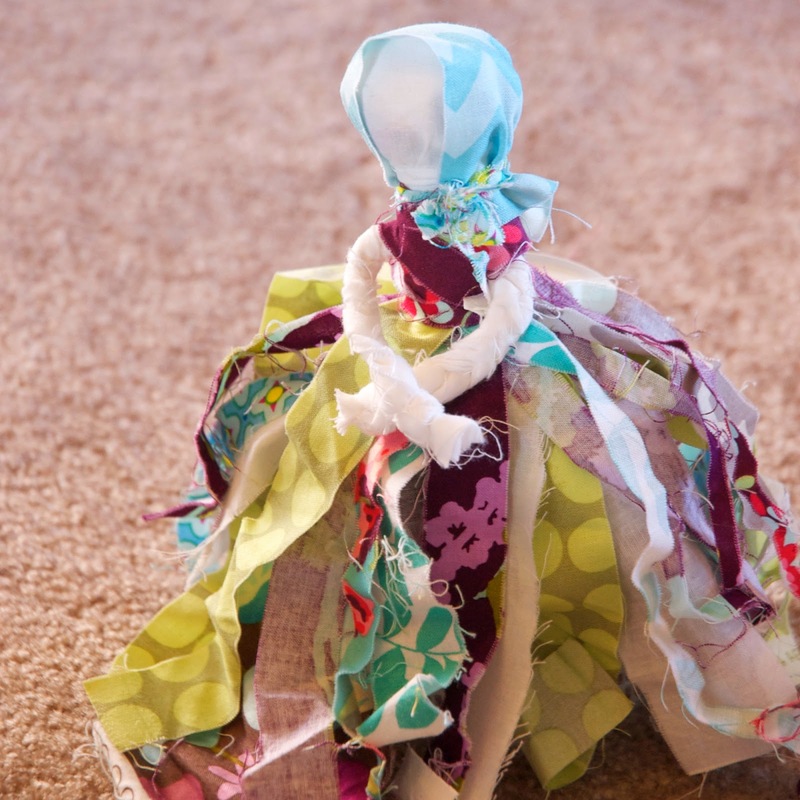 What an adorable, simple project that the girls will love! My girls are 10 & 11, and this is perfect for them! I made one for an example today if you'd like to peek at it on my Facebook page. Dilemma, Thanks so much for telling me! I will check them out! We made them for activity days last month! So fun!! !